Hello ... Hello ... my old friends ... It's great to see you once again! 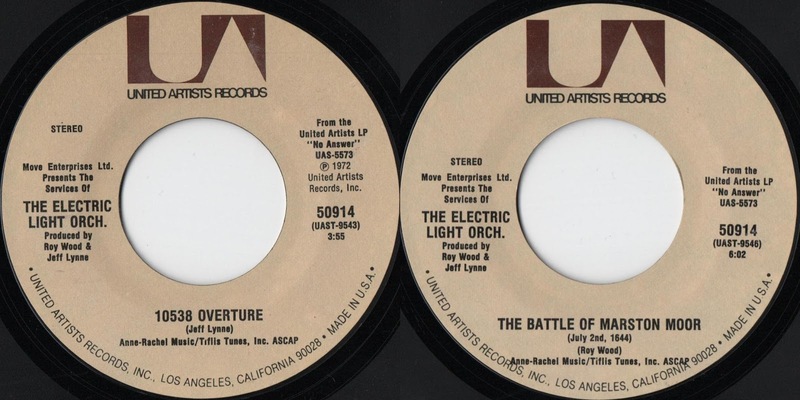 Perhaps the rarest (and most unlikely) of ELO 'B' sides is found on the 1972 US issue of their debut 7" single "10538 Overture" (United Artists #50914). Whereas the Roy Wood penned "First Movement (Jumping Biz)" was to be found on the reverse side of the UK edition (Harvest #HAR5053), the American release was surprisingly backed an alternative Wood composition: "The Battle Of Marston Moor (July 2nd 1644)". "Move Enterprises Ltd. Presents The Services Of THE ELECTRIC LIGHT ORCH." Thereafter, it would be but a short period of time before Roy left his ELO brainchild in the capable hands of co-founders Jeff Lynne and Bev Bevan. Fans and followers of ELO should never underestimate or forget the role of Roy Wood and The Move in the foundation of the band we know and still love here in Yours Truly 2016. Roy Wood: 69 (not 70) Years Old Today!